Yes you! Do you have an obsessive, compulsive and anxious kind of personality? Are you the kind of person who loses sleep anticipating what’s going to happen next and anxiously counting the days? Sadly I must admit I am that kind of person once upon a time and still a work-in-progress to turn over a new leaf. I still have not gained 100% control over this self-sabotaging traits but at least when it tries to sneak in, I am capable of reminding myself that all the worrying isn’t worth it! 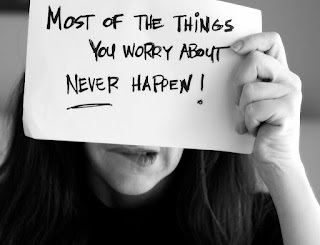 Worrying is not always bad as it can sometimes be necessary to bring about some positive results. However, excessive and all consuming worrying is definitely not. It won’t get you anywhere. It won’t change anything. It only robs you of your peace of mind and your productivity as it creates the illusions of bad things happening before they happen. Worries are merely lies that you have created in your mind and if left unattended can spiral into distracting all your efforts towards achieving your dream life. If you know about the law of attraction, you will understand that these illusions are actually a form of visualization. If you are the worry kind, then you are practically giving these illusions your full attention and you unintentionally help your subconscious mind attract whatever it is that you are worried about into reality. Majority of people encounter circumstances that they were worrying about due to the law of attraction in action. Like it or not, this natural law of the Universe is in action in your life every second of every day. Rather than letting it attract things that you do not want in your life, why not use it to your positive advantage. You can use the law of attraction to help retrain your mind to anticipate the opposite of bad things happening. Instead of anticipating the worst of every situation you can replace these illusions with positive circumstances that make you comfortable. Positive visualization ensures positive energy that will attract all that you really want. Worrying shows that you lack faith in yourself and the Universe. Faith is a decision to trust and in order for the law of attraction to work to your advantage, you have to own faith in both yourself and the decisions you made. When you own that faith, you automatically let go of your worries and trust the Universe to know what’s best for you, when would be the best time and how you’re going to achieve it. It is the next best thing for you to start working on strengthening your faith by eliminating all the negative influences in your life. Begin the practice of using positive affirmations or encouraging mantras in your daily life. Positive affirmations can be likened to your daily cheerleader that keeps you positive and steadily focus on whatever you are aiming for. Being positive and focus leaves no room for fear and worries, allowing the law of attraction to work for you favorably. Not me. I believe in crossing the bridge when I come to it and I always tell my daughter that...and to live one day at a time. She worries...a lot and very unnecessarily. If you're not, that's very good. I want to be able to quit worrying totally and concentrate on anticipating the good life every minute of my days. Being a worry-wort can really upset situations when you least need it.